A crazed nut-job attacked a practice of the congressional GOP baseball team. 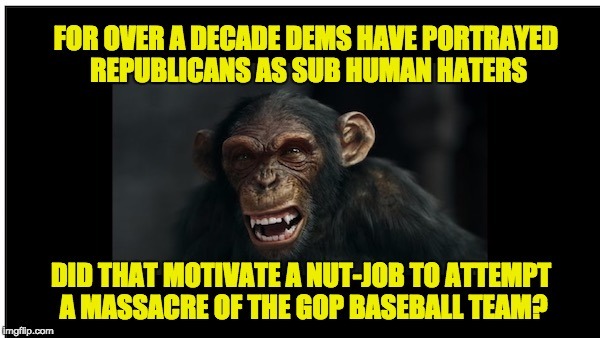 The hatred that drove 66-year-old James Hodgkinson to attempt a massacre of the Republican baseball team was that Republicans are sub-human haters. That hatred has been fermented by the Democratic Party, and it began long before Donald Trump Became president. For years the Democrats have portrayed their Republican opposition as sub-human, narcissistic, greedy, rich, fat-cat, corporate chieftains and/or hillbilly, gun-toting, women-hating, religious fanatics, and racist xenophobes who hate Jews and want to reinstitute slavery. To aid in their quest to de-humanize the opposition, the Democrats resort to name calling instead of rational discussion. When there is a distance between Republican and Democratic positions, rather than using facts, or trying to convince their political opponents that their stance is correct, Democrats tend to de-humanize their political opponents by name calling, or applying labels to anyone who agrees with the GOP stand. Thus they’ve been attempting to teach Americans that Republicans aren’t people who disagree with their political position, but rather they are sub-human hate mongers. In the 2008 and 2012 campaigns, people who believe in the sanctity of life weren’t described as pro-life, they were misogynists who were conducting a war on women. According to many Democrats, people who object to illegal aliens aren’t motivated by the rule of law, they are anti-Hispanic or racist or both. Democrat Phil Ramos (D-NY), believes the very word illegal, in and of itself, is RACIST. Democrats assume if one is a Republican or conservative they are naturally anti-Semitic. For example the ADL, which is a front group for the Democratic Party, falsely labeled Glenn Beck, Rush Limbaugh, and Ann Coulter, and others on the right side, Jew-haters. They don’t do the same with Democrats, and to be honest it’s not just the ADL. The leftist group Media Matters labeled this blogger who has been a pro-Jewish activist most of his life as a “serial Jew-basher.” And they had the nerve to do it on a Saturday when I’m not on-line. Republicans hate Muslims! Well at least according to many Democrats. And this label was applied long before President Trump issued his executive orders (which are not anti-Muslim). To the Democrats, anyone who used the term, Radical Islamists, Islamofascists, Muslim Terrorists, etc., are Islamophobic. Among those who accused were the late Alan Colmes, Campus Progress, CAIR, Professor Engy Abdelkader. There are so many other examples, GOP politicians like President Bush and Sarah Palin have been labeled as ignorant. When they oppose tax increases, Republicans are conducting a war on the poor. Republicans who opposed Obamacare wanted Seniors to die. And on and on. For too long the Democrats have refused to call Republicans people with a different opinion as to how America should be run. Instead The Left call GOPers names with the purpose of teaching voters that Republicans are some sort of evil hate group. Yes there are Republicans who attempt to label Democrats, but very few of them are in Government positions and those who are tend to be criticized by their fellow Republicans. After over a decade of hearing how Republicans are ignorant haters, does anyone really have to wonder why a crazed nut-job who believed the Democratic Party nonsense, attacked a practice of the congressional GOP baseball team?